CLIMB THE LEGENDARY ROADS OF THE GIRO! Not only are the Dolomites a UNESCO World Heritage Site, they are also the home to the mythical roads of the Giro d'Italia! Following WWII, the Italians built the most beautiful roads here so they could watch their national hero, Fausto Coppi, win the coveted Maglia Rosa in their beloved national race a total of four times. The jagged, limestone peaks that change colors throughout the day create some of the most awe-inspiring scenery on the planet! Our cycling vacation features the greatest climbs in the area such as the Stelvio, Pordoi, Gardena, Sella, Valparola, Giau, and many others that have been featured on the Giro route for decades. In addition, you'll enjoy relaxing in such scenic villages as Avelengo and Colfosco where you'll enjoy relaxing in our four-star chalets and hotels with all of the amenities you need in order to enjoy your vacation to the max. 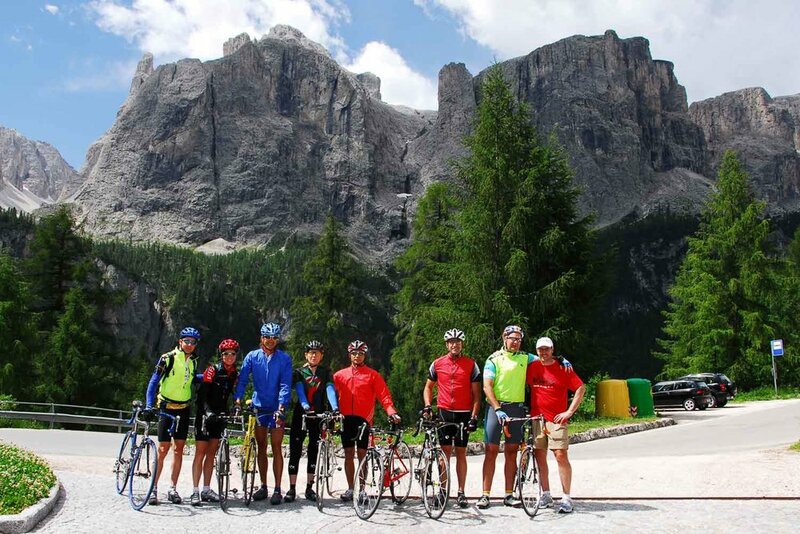 So make plans to join us this summer for an unforgettable ride through some of the greatest scenery in the world through awe-inspiring the Italian Dolomites! Price: $4995.00 pp in dbl. occp. August 26 - Welcome to Venice! Following your arrival into Marco Intl Airport, we'll transfer you to our nearby four-star hotel where our professional mechanics will assist you with building up your bike. This evening, we'll enjoy a festive "Welcome Dinner" at a local trattoria! August 27 - Venice to Avelengo Transfer / Passo di Mendola and Passo delle Palade. Enjoy breakfast in Venice before our transfer up to the Dolomites and the jaw-dropping views at our four-star hotel in Avelengo! Following our arrival, you'll begin your tour with an exhilarating descent before cycling ride over the Passo di Mendola and the Passo delle Palade. This evening, enjoy a relaxing dip in the hotel's infinity pool, one of the best on the planet, before our four-course group dinner! August 28 - The Stelvio! No trip to Italy would be complete without riding the truly legendary ascent of the Stelvio! With it's 48 switchbacks, it's one of the world's truly iconic climbs! This evening, we'll celebrate your achievement with our group dinner that features a breathtaking view over the Italian Alps and the town of Merano! August 29 - Avelengo to Colfosco / Alpe di Siusi, Passo di Gardena, and Passo di Valparola. Savor the views this morning from our mountaintop hotel and enjoy one last dip in the infinity pool before a late-morning transfer to Castelrotto. Today's ride begins with more jaw-dropping scenery as you ride up the Alpe di Siusi and the Passo di Gardena! Afterwards, reward yourself with a serpentine descent to our four-star hotel in Colfosco where the view of the Dolomites is simply out-of-this-world! Following check-in for two nights, choose a relaxing massage or extend your ride with the climb of the Passo di Valparola! Tonight's group dinner will be in authentic Tyrolean-style! August 30 - The Sella Ronda Loop! / Passo di Campolongo, Passo Pordoi, Passo di Sella, and the Passo di Gardena. Today will be one of the greatest days of your life on the bike! Beginning at our hotel, you'll embark on an unforgettable loop ride around the Sella Massif, considered by many to be the most beautiful loop ride in the world. Along the way, you'll climb the Campolongo, Pordoi, Sella, and Gardena (the same direction as the famed Maratona dles Dolomites Gran Fondo) with their breathtaking scenery! Group dinner this evening. August 31 - Colfosco to Venice / Passo di Campolongo and Passo di Giau. Your final day in the Dolomites will be simply "beyond category!" Warm-up on the Passo di Campolongo before challenging yourself on one of the toughest ascents in the region - the Passo di Giau. Reward yourself with the stunning views at the summit before descending into charming Cortina d'Ampezzo where we'll enjoy some of the best pizza in Italy for lunch! This afternoon, we'll transfer back to Venice and our airport hotel where your vacation will conclude. Choose to stay in Venice this evening, at the airport, or take an evening train out of Mestre to another part of Italy!